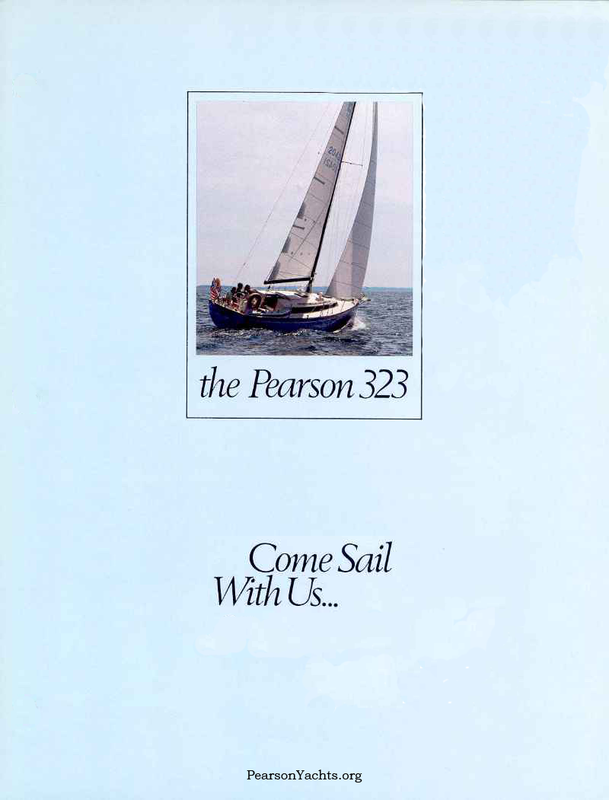 Pearson323.com is dedicated to shared information and knowledge on the Pearson 323. This model is a 32 foot sailing sloop that was built from 1976-1983 by Pearson Yachts with approximately 385 hulls produced. As a seaworthy, affordable, and honest cruising boat, many of these Bill Shaw designed craft are still being enjoyed around the world. 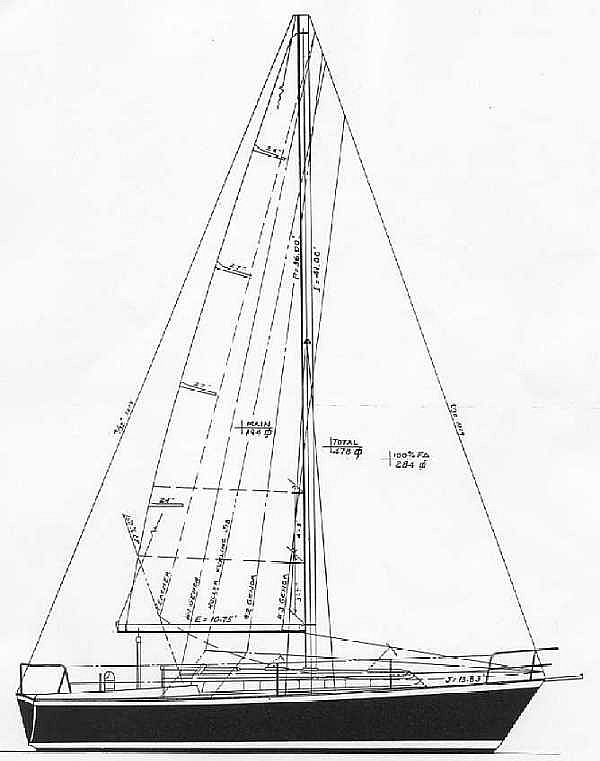 Boat design philosophy is covered here, along with boat specifications, technical information, and a repository of original Pearson documentation. Once you own a P323 you will probably spend time making her more to your liking. There are detailed projects and tips that owners have contributed as shared content. There is an owners database which includes boats by hull number or region and a photo gallery with an album for each boat owner. 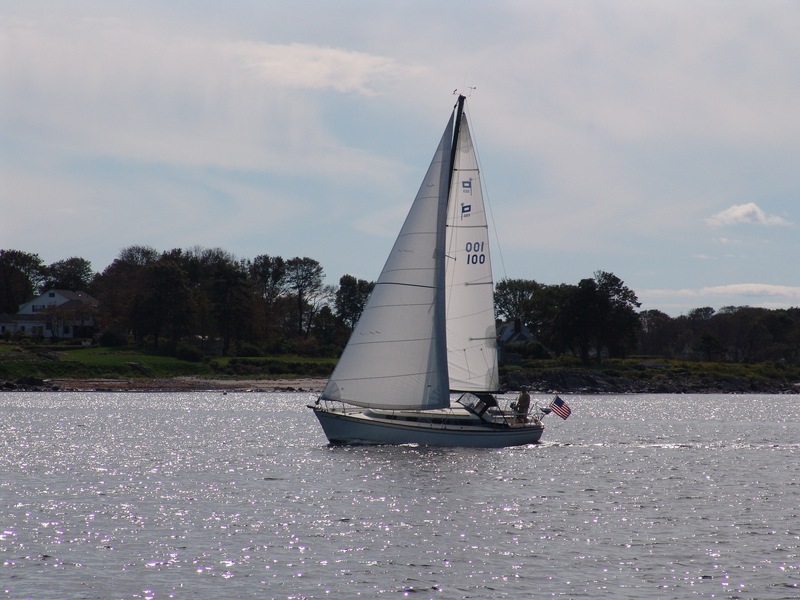 There is a Captains Forum that is a valuable repository of information for boat owners. We welcome all sailors to register here if you have not done so. 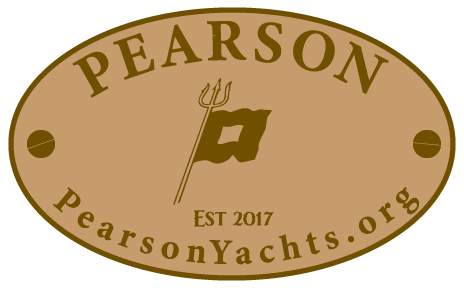 PearsonYachts.org is now on the menu as an internet portal for all Pearson Owners, take a Virtual Cruise! Welcome aboard your new Pearson-323! We are proud to have you join the thousands of other Pearson owners and hope you will find your owners guide helpful and informative. Your decision is a source of great satisfaction to PearsonYachts.org*, and we are confident your new boat will provide the same for you. By selecting a Pearson, you have expressed a confidence in the brand. 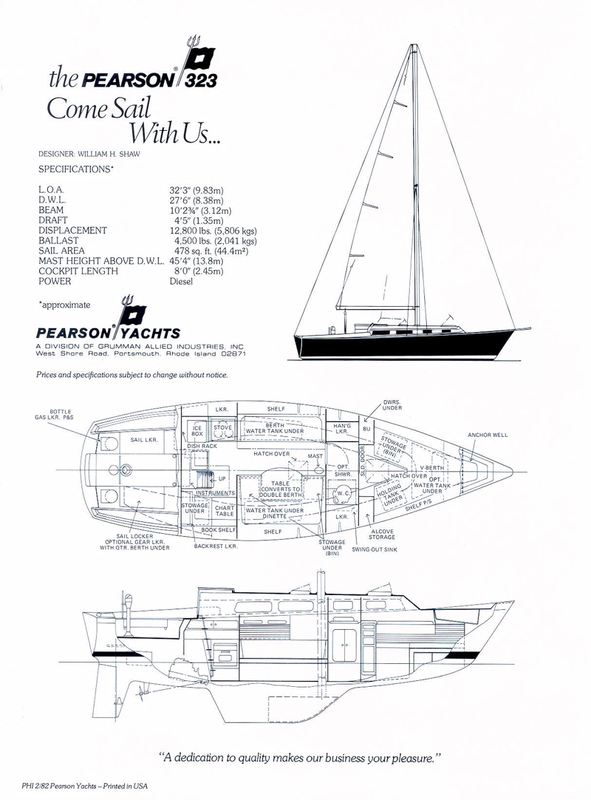 You can rest assured that we (Pearson Yachts Inc) had made every effort to support your trust. Every Pearson Yacht has been manufactured by dedicated professionals and craftsmen of the finest materials available at their time of production. 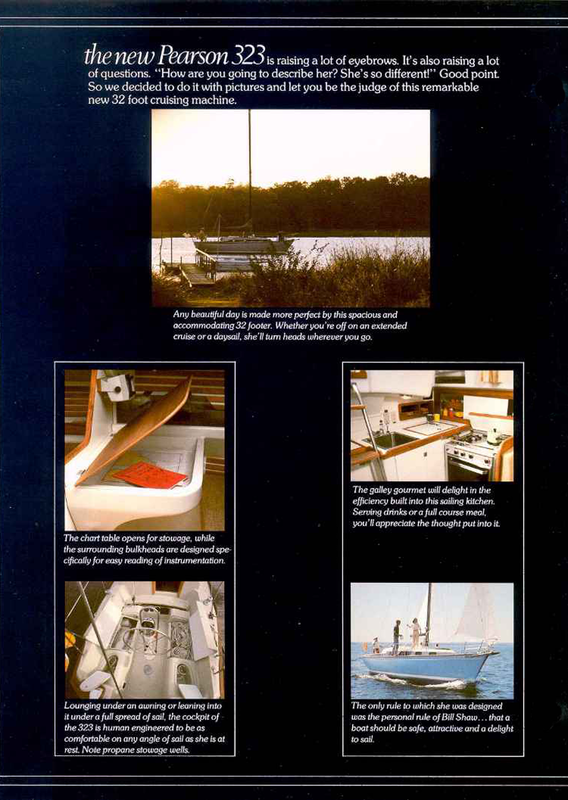 The owners manual is intended to guide you through your first days of ownership of your Pearson Yacht. She asks only that you treat her as one of the family, and she will return all you can ask of her and more. Individual instruction manuals from the manufacturers of installed equipment may also be needed where more detailed information is required. Before getting underway, please take a few moments to familiarize yourself with the operations and functions of the various systems designed into the 323 to insure proper operation. In the event that additional information is needed, we suggest you post your questions to the "Captains Forum" for advise from other Pearson owners. Please accept our congratulations. Have fun and smooth sailing! 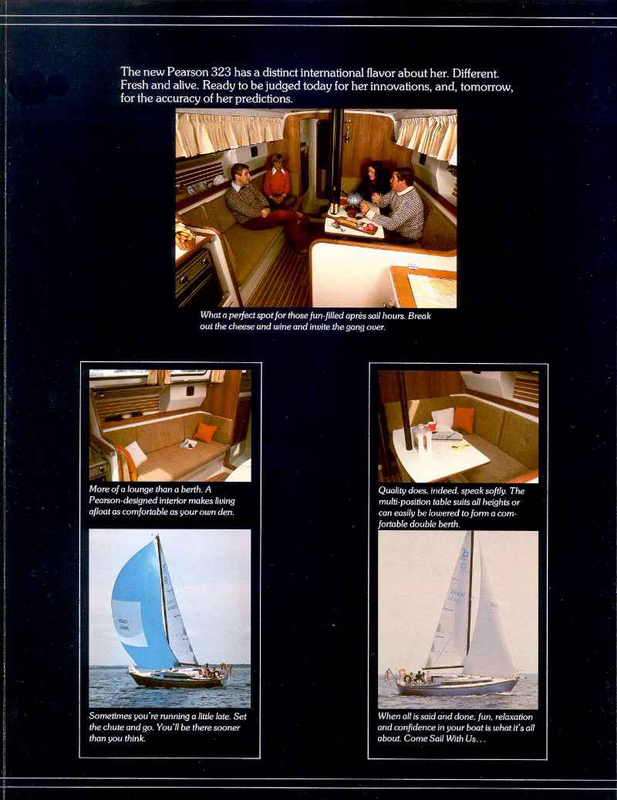 Text followed by original brochures, 1977 Pearson Yachts Inc. The New Pearson 323 is raising a lot of eyebrows. It’s also raising a lot of questions. "How are you going to describe her? She’s so different!" Good Point. 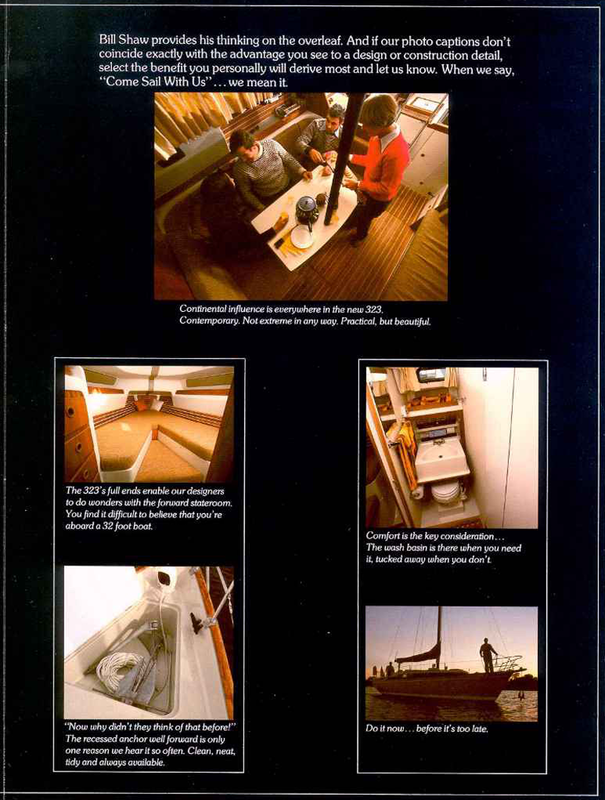 So we decided to do it with pictures and let you be the judge of this remarkable new 32 foot cruising machine. Any beautiful day is made more perfect by this spacious and accommodating 32 footer. Whether you’re off on an extended cruise or a daysail, she’ll turn heads wherever you go. The chart table opens for storage while the surrounding bulkheads are designed specifically for easy reading of instrumentation. Lounging under an awning or leaning into it under a full spread sail, the cockpit of the 323 is human engineered to be as comfortable on any angle of sail as she is at rest. Note propane stowage wells. The galley gourmet will delight in the efficiency built into this sailing kitchen. Serving drinks or a full course meal, you’ll appreciate the thought put into it. The only rule to which she was designed was the personal rule of Bill Shaw…that a boat should be safe, attractive and a delight to sail. The new Pearson 323 has a distinct international flavor about her. Different. Fresh and alive. Ready to be judged today for her innovations, and, tomorrow, for the accuracy of her predictions. What a perfect spot for those fun-filled apres sail hours. Break out the cheese and wine and invite the gang over. More of a lounge than a berth. A Pearson-designed interior makes living afloat as comfortable as your own den. Sometimes you’re running a little late. Set the chute and go. You’ll be there sooner than you think. 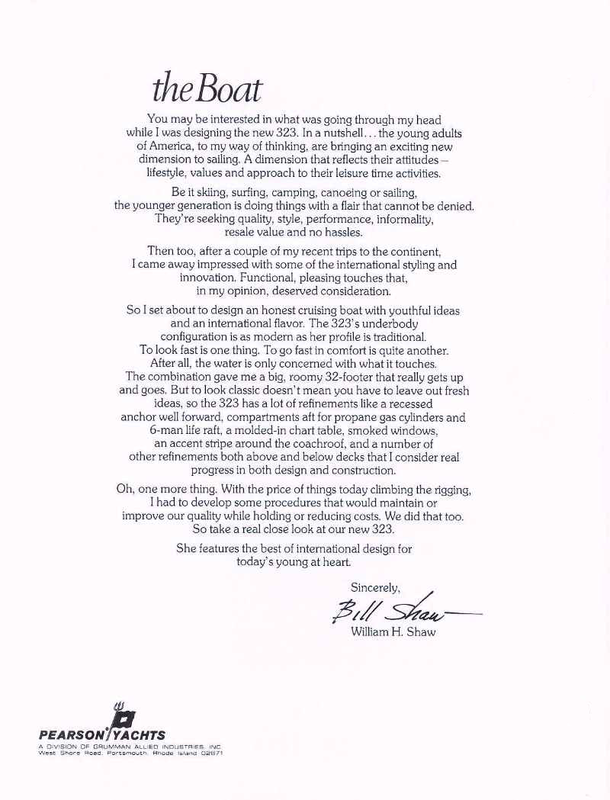 Bill Shaw provides his thinking on the overleaf. And if our photo captions don’t coincide exactly with the advantage you see to a design or construction detail, select the benefit you personally will derive most and let us know. 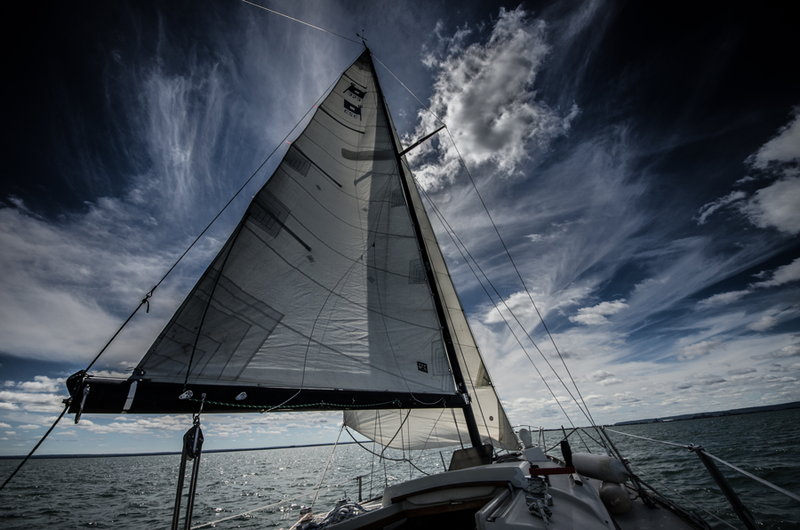 When we say, "Come Sail With Us"… we mean it. Continental influence is everywhere in the new 323. Contemporary. Not extreme in any way. Practical, but beautiful. The 323’s full ends enable our designers to do wonders with the forward stateroom .You find it difficult to believe that you’re aboard a 32-foot boat. "Now why didn’t they think of that before!" The recessed anchor well forward is only one reason we hear it so often. Clean, neat, tidy and always available. Comfort the key consideration… The wash basin is there when you need it, tucked away when you don’t. Do it now… before it’s too late.